Siding has three purposes: insulation, weatherproofing, and beauty. Twin Pines will evaluate the state of your siding and help you determine the best way to proceed. If you’re not sure what kind of siding is best for your home and budget, we’re here to walk you through the options and features to find the perfect siding product for you. Siding repair isn’t always the answer. When it’s time for siding replacement, Twin Pines will install your new product with accuracy and professionalism, ensuring a high-quality exterior with excellent curb appeal. Let’s make your home’s makeover an enjoyable experience with a huge selection of siding materials, styles, and colors. Vinyl siding is a PVC material that can look like cedar, tile, or stone at a significant cost savings. It’s the most popular siding choice in the Milwaukee area for being attractive and almost completely maintenance free. Unlike other siding materials, it never requires painting and comes clean with soap and water. It’s pest free and resistant to damage and dents. Twin Pines offers Mastic Home Exteriors by PlyGem for its beauty, durability, and low-maintenance performance. They’re the only siding manufacturers to promise no fading and no distortion. Plus, your home will be stunning with Mastic’s richer, bolder colors. We offer premium insulated siding from Exterior Portfolio by CRANE. If you’re looking for a better R-value, wind resistance, noise reduction, impact resistance, and maintenance freedom, triple-width CraneBoard is the highest quality choice at the best price. From low-maintenance traditional siding with a raised woodgrain finish, to the rustic beauty of shake and shingles, Exterior Portfolio is a home designer’s dream with performance to match. Although it is an eco-friendly blend of fibers, sand, and cement, fiber cement siding resembles wood or stone. It’s the next step up from vinyl siding and is growing in popularity for its durability, affordability, and variety. If properly maintained, fiber cement is expected to outlast other siding materials. James Hardie is the world leader in fiber cement siding and backerboard. 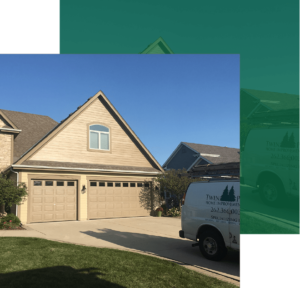 James Hardie offers an array of siding products from lap siding to shingles, vertical siding to panels, all engineered to excel in southeastern Wisconsin’s climate. With fiber cement, proper installation is the key to avoiding problems, and Twin Pines installers have the expertise needed for long-lasting siding. We are a James Hardie Preferred Contractor. If you want the beauty of wood siding without the hassle, engineered wood is for you. It’s an inexpensive, eco-friendly product of composite wood and wood-based fibers blended into a uniform appearance. It’s smoother than hardwood, less prone to infestation, and much less expensive. Twin Pines offers LP SmartSide products, which are specially manufactured and treated for strength and durability against harsh weather, fungal decay, and termites. It’s also the most beautiful engineered wood siding on the market for warm, welcoming curb appeal.